The Tides Marine shaft seal system, is the market leader in dripless propeller shaft sealing. SureSeal™ has become an industry standard which is fitted to many production-built power boats, yachts and commercial craft. 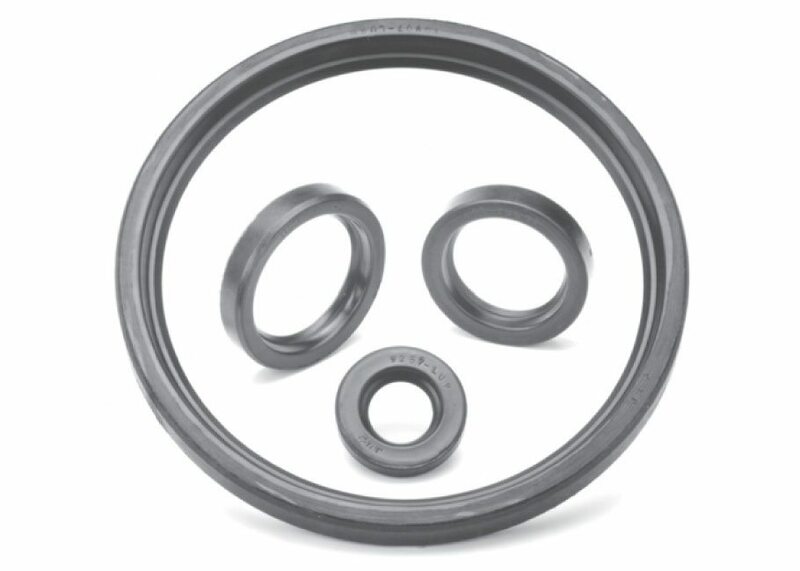 The Tides Marine SureSeal™ system is a self-aligning shaft seal. The one-piece fibre-reinforced composite housing consists of a water lubricated PTFE shaft alignment bearing and lip seal. With no metal components, Sure Seal is inert to electrolysis. Once the bearing is on the shaft, the risk of misaligning the SureSeal™ is reduced. The housing is connected to the stern tube by the means of an articulating hose which means there's no measurement required resulting in very simple, self aligning fitting. The hose reduces side loads to the SureSeal™ when shaft misalignment occurs, extending the life of the bearing and lip seal. SureSeal™ units have a worldwide warranty of 2500 engine hours, or two years (whichever comes first). Lloyds type and ABS Certification. Spare lip seals in a special carrier case can be installed on the shaft at the time of installation. This allows for a simple change-out of the lip seal if it should be damaged. This can be done without the need to uncouple the shaft or the expense of removing the vessel from the water. SureSeal™ can be easily fitted as a replacement for traditional packed glands or to upgrade from face seals. We can utilize the shell of your existing packing gland. When upgrading from a face seal, the Sure Seal eliminates the need to worry about any pre loaded tensions of rotor collars. Don't forget to look at the SMART SEAL temperature Alarm system as the perfect safety accessory to your SureSeal. Tides Marine Nitrile Lip Seals are specifically designed for each type of sealing application, whether propeller shaft or rudder stock. The outer shell is made of an Aramid fiber composite which is integrally molded to a rubber hinge and a nitrile lip edge. A 316-stainless steel garter spring is incorporated to distribute loads uniformly over the propeller shaft or rudder stock. When ordering replacement lip seals, please note whether you have a SureSeal™ or a Strong-Seal™ installed in your vessel. There is a part number on the face of the lip seal which will identify the exact replacement seal required. 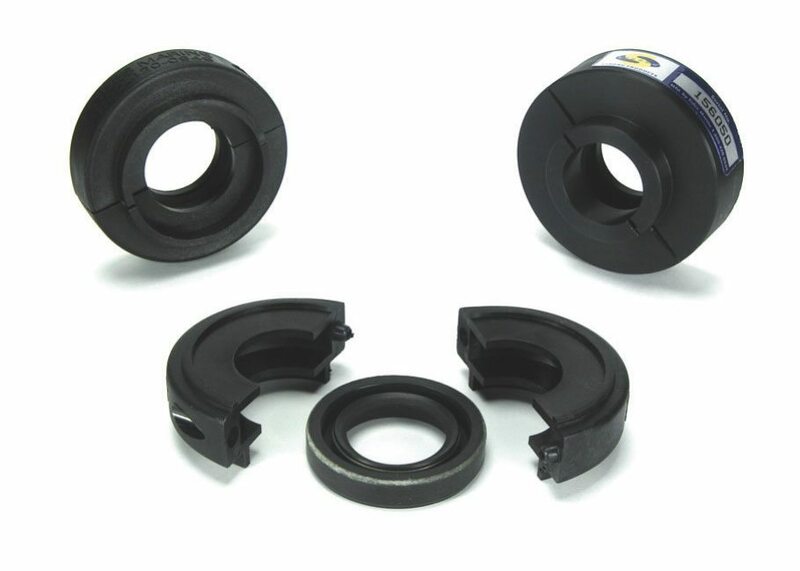 Tides Marine Spare Seal Carriers were developed as a convenient device to store spare lip seals. 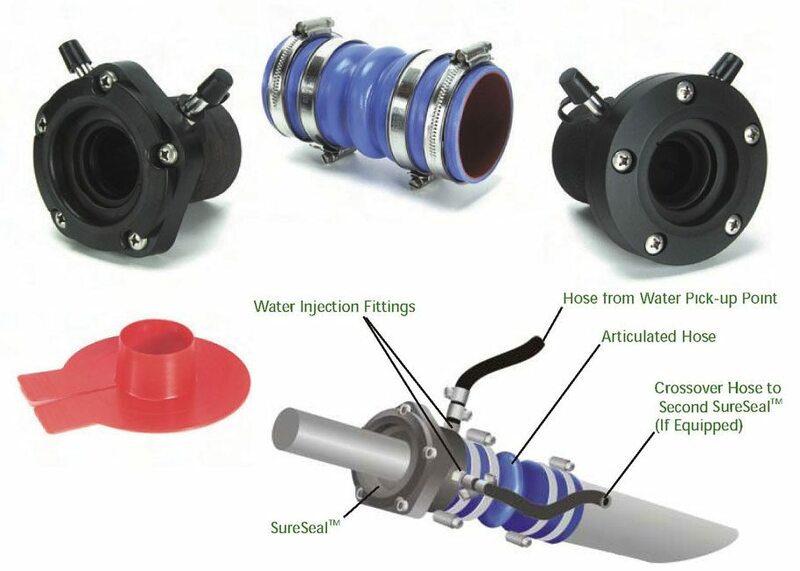 Installed at the same time as the SureSeal™, these carriers protect the spare lip seal mounted on the shaft and allow the vessel operator to replace a worn lip seal without uncoupling the shaft from the transmission or the expense of removing the boat from the water. The Spare Seal Carrier is a light-weight, two-piece, nonmetallic housing which is clamped to the propeller shaft between the SureSeal™ and the transmission coupling. They are available to suit all seal sizes. Spare Seal Carriers for propeller shafts up to (and including) 1 3/4" include one spare seal and housing. Carriers for propeller shaft 2" to 3" include two spare seals and housings. Carriers for 3 1/4" propeller shafts and above have two spare seals in one housing. Tides Marine and Pros by Ditel have upgraded the Smart Seal Temperature Monitoring System: The Generation 2 unit is now available. 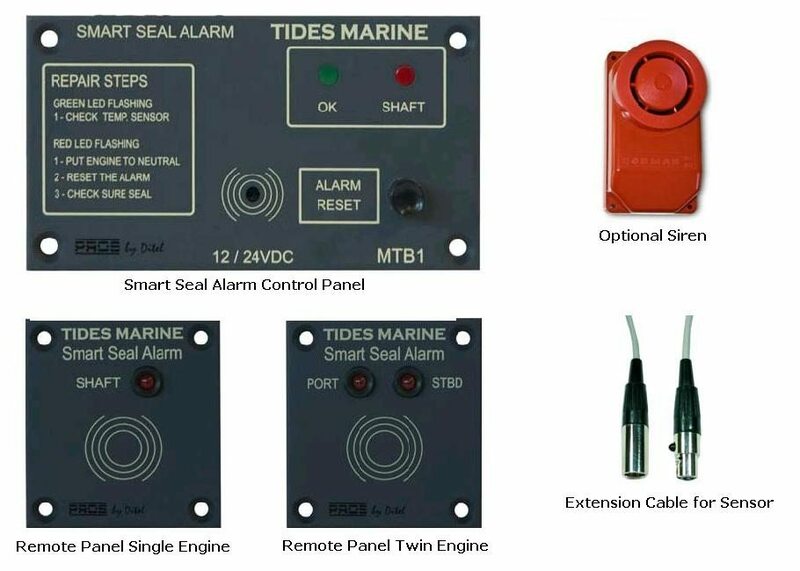 Smart Seal is an overheat warning system that uses solid state sensors to monitor the operating temperature of Tides Marine’s American Bureau of Shipping-certified propeller shaft seal systems found on many commercial and pleasure craft. Smart Seal Generation 2 incorporates a new flush mount control panel with dedicated versions for single and twin engine configurations, and has a quick-connect wiring system for both unit power and temperature sensors. Fittingthe Smart Seal is a straightforward installation. SMART SEAL works with both new builds and retro-fit markets.